Random Beauty by Hollie: Watch in Box !?! I'm so excited to share with you what I got last weekend! Last Friday (Jan. 21), I was about to end my shift at 3:00PM my hubby suddenly texted me to come home as soon as possible without telling me what the reason was. I honestly thought it was something urgent or maybe we were going to buy some groceries. But when I got home I asked him what was wrong. He replied, "nothing" I just wanted to you come early. Ugh! I was pissed because I really was hurrying home. Without further adieu, Here it is! 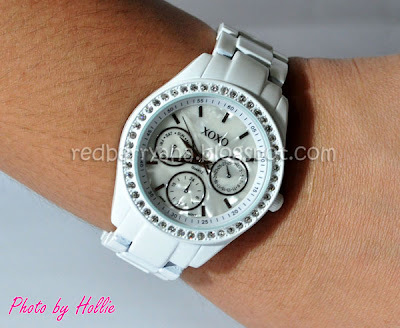 an XOXO Women's XO114 Rhinestone Accent White Enamel Bracelet Watch that he bought from a friend Doctor who just arrived from the US. How about you, have you received any sweet gestures from your partner recently? I would love to hear your experiences as well. Amazing... i love being surprised! :) Im kilig for you! That's so cute!! Your hubby's the sweetest! awwwww! so sweet! surprises are the best thing ever! I'm really glad that my hubby still makes surprises for me, it's really touching. I really love the white color and rhinestone details, it looks very elegant yet stylish at the same time. @Janel, thanks. I though so too.